Home > News & Blogs > Accident Claims > Is your child at risk due to their car seat? Is your child at risk due to their car seat? I know I’m not alone in finding car seats baffling. Not only are there so many types to choose from, but fitting them can also be a nightmare. They remind me of a task on the Krypton Factor (I know I’m showing my age!). The consumer service Which? surveyed over 2,000 parents, in February 2014 and found that many are uncertain about the laws and regulations surrounding the use of child car seats. While the number of eligible children not using the correct car seat has fallen from 17% in 2010 to just 5% in the most recent poll, there is still a great deal of confusion amongst parents about how and what type of car seats should be used. The survey also revealed rather worryingly, that 80% of child car seats are not fitted properly and only 6% of parents had received advice about fitting the car seat from the retailer. The majority of parents surveyed (9 out of 10) admitted that they had experienced problems fitting the car seat. It’s Child Safety Week this week (23 – 29 June 2014) which is an annual campaign by the Child Accident Prevention Trust to raise awareness of the risks of child accidents and how they can be prevented. This year, they are focusing on the accidents that are more likely to happen during the morning rush which got me thinking about the mad dash to get the kids to school or nursery and the risks of serious injury associated with a child being in an inappropriate car seat or a car seat which isn’t fitted correctly. The very sad case of Hughes v Williams & Williams  EWCH 1078 is a timely reminder to parents during child safety week, of the importance of placing children in the correct car seat. This case involves Emma Hughes, a 3 year old girl who suffered devastating brain and spinal cord injuries in a road traffic accident. Her mother was found to be partially to blame for her injuries, not because of her driving, which was said to be faultless, but because she had placed Emma in an inappropriate car seat. On the day of the accident Emma’s mother placed Emma in a Graco booster seat in the back of her car, and secured her with an adult seat belt. She had also fitted a Mamas & Papas “Pro Tech” five point harness child car seat in the car which had a solid back. She felt that Emma wasn’t comfortable in the full car seat, whereas she looked comfortable and secure in the booster seat. Emma was described as a “chunky” child and her mother found it difficult to lift and manoeuvre her into the car seat. The defendant was speeding and lost control of his vehicle which was travelling in the opposite direction and swerved into the path of the car carrying Emma and her mother. Liability was admitted by the defendant’s insurers; however they maintained that Emma’s mother was partly to blame for the accident for failing to place Emma in the correct car seat for her age, weight and height. 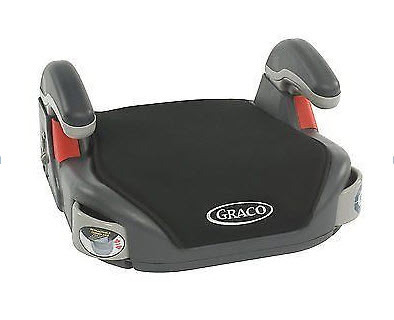 The booster seat came with detailed instructions which made it clear that it was suitable for children aged approximately 4-10 years old, weighing between 15-36kg and 101-145cm in height. Emma weighed 15kg was 93cm tall and was 3 years and 2 months old at the time of the accident, therefore she only just met the weight criteria but did not meet the height or age requirements. She met all of the requirements for the five point harness child car seat. Emma’s mother admitted she had read the instructions that came with the booster seat, including the statement that the booster seat should only be used if the child met all requirements. She had also carried out her own research by observing the use of car seats by other parents and the nursery school which Emma attended. 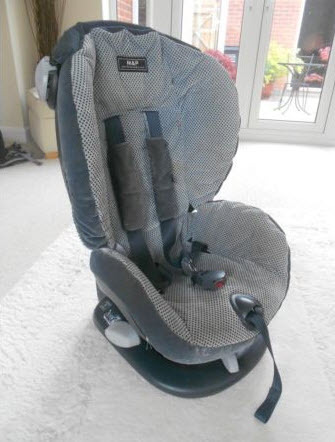 Expert evidence in the case showed that had Emma been placed in the five point harness seat, instead of the booster seat, her injuries would have been far less serious, for example the spinal cord injury would have been avoided and there would have been a reduced risk of the brain injury. Nevertheless Emma’s mother was found to be negligent for placing Emma in the booster seat which was deemed inappropriate for Emma and she was held to be 25% to blame for Emma’s injuries. The court considered, the case of Jones v Wilkins  R.T.R 19 where a two year old child was seated on her mother’s lap with only a lap belt restraining her when the defendant collided with the vehicle causing the child to suffer paraplegia. The Court of Appeal decided that although the blame to be attached to the mother was limited by her lack of understanding of the risk, she remained 25% liable for her daughter’s injuries. It is clear that a parent owes a duty of care to their child to take reasonable steps to ensure that the child is properly restrained when travelling in a car, but how can a parent be sure that their choice of restraint is appropriate and will fully protect their child from suffering serious injury should an accident happen? There are many different types of car seat available, so it’s not surprising that parents may be confused about what seat is the most appropriate for their child. The table below sets out this information in a handy table which I have taken from the ROSPA website. Fortunately the challenges of ensuring that the car seat is fitted correctly should become a thing of the past due to i-size which is the name of a new EU safety regulation for child car seats (ECE R129). Under the existing laws, parents could switch their baby from their rear-facing Group 0/0+ seat into a forward-facing one when they reached 9kg – (around nine months old). When the new regulations, come fully into force, parents will have to keep their baby in a rear-facing seat until they are 15 months. The move will be based on a baby’s length/child’s height not weight. i-size was introduced in July 2013 in order to make child car seats easier to fit, provide better protection from side impacts and keep children rearward-facing for longer. i-size only applies to Isofix seats. If you have a relatively new car, it’s likely to have Isofix mounting points. This is the standard system for all new cars and seat manufacturers, designed to make installing your child safety seat quick and easy as you simply ‘plug in’ a compatible car safety seat to mounting points in the car. 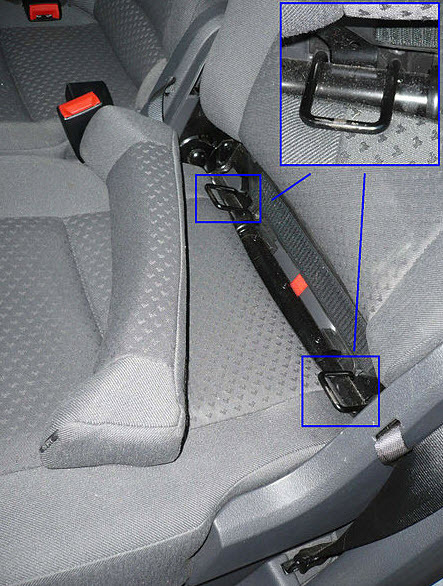 Here is an image of an example of Isofix anchor points. This regulation has been adopted by the EU, and UK legislation is currently being amended to adopt it into UK law. Once UK legislation has been amended, i-size will run side by side with the existing R44.04 standard until approximately 2018. Parents will be able to buy and use child car seats that meet R44.04, and which are fitted with seat belts or Isofix, or use i-size seats instead. The new regulations will be phased in over five years, running in parallel with the old regulations for some time. They will only apply to Isofix seats sold and belted ones will not be covered by the new rules. It’s obviously absolutely devastating for any parent whose child suffers life changing injuries, but it’s beyond comprehension as to how it must feel to be held partly responsible for those injuries. I’m hopeful that the new regulations will make it much easier for parents to choose the correct car seat for their child and to fit it properly to ensure their child has the maximum possible protection from serious injury in the event of a road accident.